Cheyenne East High School is a public secondary institution located in Cheyenne, Wyoming, and serves Laramie County School District #1 (grades 9-12). 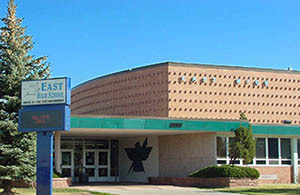 East High School was established in 1960, when Cheyenne High School was split into two schools. LCSD1 now offers four high schools, three of which feature a full-range of classes and varsity athletic programs (East, Central and South), and one alternative high school (Triumph). The current principal is Mr. Sam Mirich, who is assisted by Mrs. Fawn Bartlett, Mr. Tommy Cress, and Mr. Marc Kerschner. The office manager is Mrs. Mary Jo Lucas. Mr. Jerry Schlabs serves as the athletic director. EHS serves students who attend Carey JHS, Alta Vista ES, Anderson ES, Baggs ES, Buffalo Ridge ES, Dildine ES, Henderson ES, and Saddle Ridge ES in Cheyenne. The school’s current enrollment is approximately 1,500 students, who are served by over 200 teachers and staff. In addition to AP programs, East High is home to the LCSD#1 International Baccalaureate program, an advanced pre-university program that encompasses all of a student’s core classes, as well as IB electives. The IB program strives to develop strong academic and social characteristics in students in preparation for careers and college. East High is home to nearly 40 clubs, groups and activities for students, including regionally and nationally recognized 4-H, DECA, FBLA, FCCLA, FFA, journalism, drama, Air Force ROTC Drill Team, marching band, and National Honor Society programs. East High encourages all students to become involved in school and state-sanctioned activities. East High also has a long history of impressive athletic success. With 58 regional championships and nearly 70 state championships in the school’s history, East High is synonymous with winning. In just the last 15 years, the Thunderbird athletes have won 25 state championships. The football team won titles in 2007 and 2013. The cheer team placed first in 2004, 2008 and 2010. The Lady Thunderbirds basketball team won in 2010 and 2017, and the boys won in 2006. The boys indoor track team won titles in 2002 and 2011, and the girls won it all in 2012. The girls swim team also won their title in 2012. The Lady Thunderbirds soccer team won consecutive titles in 2001 and 2002 and then three-peated in 2013, 2014 and 2015. The boys soccer team won in 2001,2004 and 2017. The Thunderbird wrestlers won a state title in 2018. And the Lady T-Birds volleyball team won state titles in 2003, 2004, 2012, 2014, 2015, and again in 2017. East High athletics is proud to claim 29 Gatorade Player of the Year award winners. East High competes in Wyoming’s largest varsity classification – 4A. The official school mascot is the Thunderbird, also known as “Boomer,” and the school colors are Columbia Blue and Black.